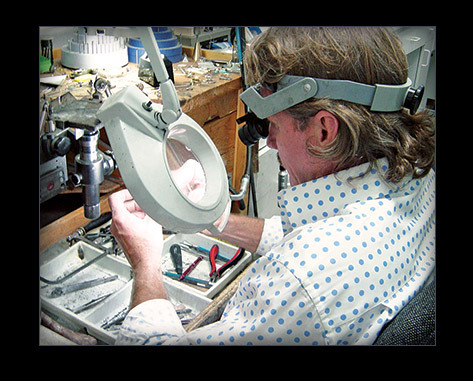 Russell is a 3rd generation jeweler as well as a master jeweler. He discovered his passion for jewelry making at a very early age and has been creating custom one-of-a-kind jewelry designs since 1984. He truly listens to his clients’ desires and has a unique collaborative style when developing a new design or integrating heirloom jewelry into a new piece. Russell’s unique creative voice is expressed through his exquisite castings and fabrications in 22 KT, 18 KT, and 14 KT gold as well as platinum. He is also a master with sterling silver, making some of his best pieces in this popular precious metal. He designs in forged, hand-formed and fused gold work, (with textured metals being his personal favorite). Russell is a lapidary artisan as well as an expert in cutting natural stones, which is quickly becoming a lost Art. Russell is also an expert at setting diamonds and colored stones. One of Russell's passions is sharing his knowledge and love of jewelry, which is why he and Irene opened their Jewelry Design Center School. Russell teaches some classes and also invites guest teachers from all over the country, so others may learn to develop their love of jewelry and hidden talents.